It’s no secret that making healthy freezer meals can save you tons of time and money. Pinterest abounds with recipes for easy freezer meals that you can make ahead of time. They help save money on takeout, allow you to shop the sales, and are perfect for days when you just.can’t.cook.dinner. But what about the days where you just CAN’T with finding a healthy breakfast for toddlers? Or when you can’t stomach the thought of coming up with original lunch ideas for kids? We’re not shy about the factfact we HATE making sandwiches every day, and would do just about anything to avoid doing it- even if that means sandwich-prepping in bulk. 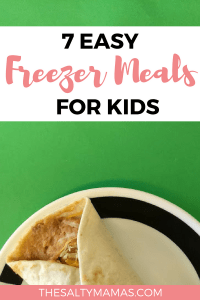 So if you are looking to save time and money on toddler lunch ideas they’ll actually EAT, check out these genius ways to create healthy freezer meals for kids that they’ll LOVE. This post contains affiliate links. You can read more at our legal page. Thanks for your support! These little “pancakes” have only two ingredients- eggs, and mashed overripe banana. Simply mix the two together and cook in a pan preheated over medium heat (don’t forget the nonstick spray or a little oil or butter!). Once again, you can flash freeze these ahead of time, or just place in single-serving size stacks (my kiddo always eats at least three at a time) in a freezer bag. These little muffins pack a big nutritional punch. 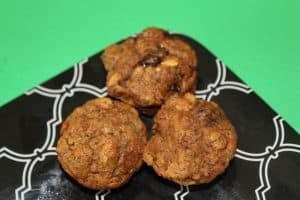 They are filled with whole wheat, fruits, eggs, and even veggies. And the good news? They don’t actually taste like any of those things. Pin the recipe for later here, and then bake in bulk. Flash freeze (place in the freezer on a cookie sheet or plate for about half an hour, or until frozen solid-ish), and then place in a freezer bag. We’ve got even more easy ideas for quick breakfasts- so many, in fact, that we wrote a whole post about it! Check out the rest of our ideas for Easy Breakfasts for Busy Mornings for more ways to fill your freezer with wholesome goodness. A standard of Mexican restaurants everywhere, these are a great way to use up extra taco supplies. 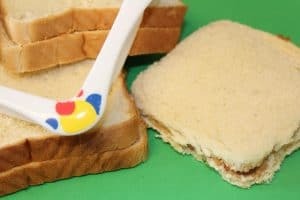 Even if you purchase all the supplies just for this meal, they are pretty cheap, filling, and easy for little hands to hold on to. I like to heat the tortillas in the mircowave first (whole wheat when possible), for about thirty seconds. I lay out a cutting board and spread out the tortillas before spreading them with canned refried beans (or make your own if you’re so inclined). Sprinkle with cheese, fold up, and microwave again for another 15-20 seconds, or until the cheese is melted. Freeze in a single layer in a Ziploc bag. We learned about this trick from Jordan at FunCheapOrFree.com. Instead of getting out and making sandwiches every day, you can make the sandwiches in bulk once a week and just take out what you need. Lay out your bread assembly line style and spread with peanut butter and jelly. If you’re going for an Uncrustables vibe, you can use a Pampered Chef Cut N Seal tool. It’s not exactly the same, but we greatly prefer this square crust remover. It removes the crust and slightly seals the edges without creating cracks in the bread (or wasting so much of the sandwich). A few gentle presses, and your sandwiches are ready for the fridge or freezer. If your kids prefer meat and cheese sandwiches, you can do the same with lunch meat. Jordan suggests you spread them with condiments first and then place the cheese between slices of lunch meat, as the cheese tends to stick to the bread as it thaws (see her post here for more detailed suggestions). When you are ready to freeze your sandwiches, you can either freeze in a single layer in a Ziploc bag or use the bread bag they came in. Place a pice of wax paper between sandwiches and then stack them back in the bread bag they came from. Remove one sandwich at a tme as needed and then close the bag back up. These are another great way to use up cheese or tortillas before they go stale, or to make the most of a sale at the grocery store. Simply lay out your tortillas, fill with cheese, and microwave for 30 seconds. 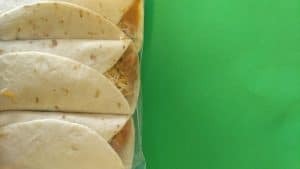 I like to use one tortilla folded in half, as my kids have small appetites (sometimes, anyways), but you can easily use two tortillas if your kids tend to be hungrier. You can also get creative with how you fill them- add black beans, shredded chicken, or sneak in some veggies when you can! 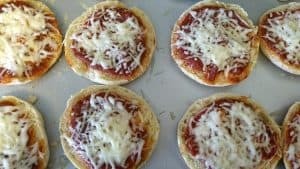 Simple and fun, these English muffin pizzas are another yummy and affordable lunch option. I typically buy English muffins when they’re on clearance for 50 cents or so. Split them in half, spread with pizza sauce, and sprinkle with mozarella cheese. Bake at 350 degrees for ten minutes, or until the cheese is hot and melty. Freeze in a single layer in a Ziploc bag. Lila is a potato soup fanatic, especially for this loaded potato soup recipe that tastes just like the one at Disneyland’s Carnation Café. Abe is all about the pasta and veggies in his mama’s homemade minestrone soup (pin the recipe here). But let’s be real- I’m not whipping up soup from scratch for lunch on a random Tuesday. Instead, I take the leftovers from these meals when we have them for dinner and freeze them in single-serving portions. You can either fill a sandwich-sized Ziploc bag and freeze flat, or freeze them in plastic cups. When they are frozen solid, run the cups under warm water to release them, then store them in a gallon size freezer bag. Voila, you’ve got homemade soup for your kids’ lunches whenever they request it. Adding these few staples to your freezer will give you a break from the monotony of coming with lunch ideas for kids, and give some variety to a menu plan filled with chicken nuggets and Mac and Cheese. What are YOUR go-to kid lunches? Tell us in the comments below!